1. Theme - ANYTHING cooked in a Microwave. But entire cooking needs to be done in the MW only. No stove top or oven or grill allowed. You can of course use food processors/blender & other grinding/cutting apparels. 2. Only vegetarian entries. Eggs are allowed. 4. Entries posted OR re-posted between December 1st-31st 2011 will only be accepted. 7. Event open to all bloggers & non-bloggers. 8. At the end of this post, there's a linky tool. Link your entries there. My MW is dead...will miss this one! The salt and pepper did not seep into the okra, but the pieces were small and the flavor was there from the coating itself. Very well phrased kavi..thanks for hosting...btw that mention abt the 10th grade, gosh that does make me feel ancient,,heheh...kidding ok!.. Oye Kavi! 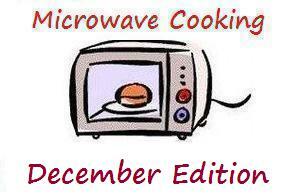 Want to participate but need some ideas from your side on how I can use my dabba microwave! Happy hosting dear. I will send my entry soon. Thanks for hosting ...will link my recipe soon. Hi, linked my recipe. It will be awesome if you can participate in my event!